Luxury Rattan Dining Sets There are 5 products. 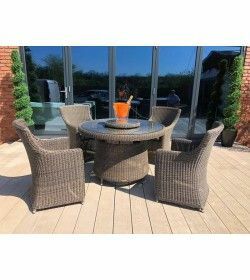 4 Chair Rattan Dining Set … A stunning all rattan dining set with 4 chairs and hand finished to the highest specifications … Hand woven and built for comfort. 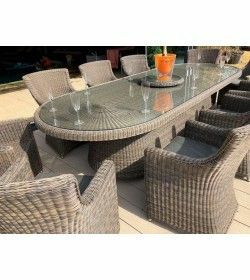 all rattan dining set with 6 chairs and hand finished to the highest specifications … For larger domestic and commercial environments this all rattan dining set is hand woven and built for comfort. The glass on the table top is tempered and 8mm thick making it perfect for regular use. 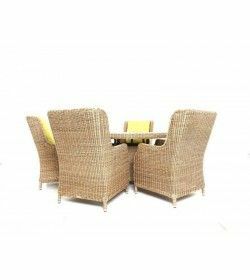 all rattan dining set with 10 chairs and hand finished to the highest specifications … For larger domestic and commercial environments this all rattan dining set is hand woven and built for comfort. The glass on the table top is tempered and 8mm thick making it perfect for regular use. Simplicity offering an intimate socialising experience with long-lasting quality at the same time. The Willow 6 Chair Set is hand woven with the weave wrapped around a reinforced aluminium frame making the whole set lightweight, durable and rust free. Costa Blanca, Costa del Sol, And all other Areas of mainland Spain and the islands. Other popular products include Havanna rattan furniture range, Arizona rattan furniture range, all rattan furniture sets in Spain.